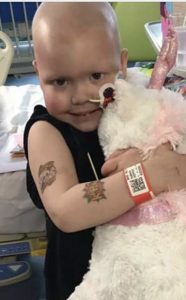 Izzy has been in hospital for the past 17 weeks under going intensive chemotherapy. 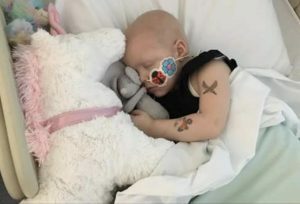 Her wish to Post Pals was for ‘a fluffy unicorn’ and Shamyla kindly granted that wish, sending a huge snuggly unicorn, tattoos and some other goodies. We think judging by her smile she loves it! !